Lucy Maud Montgomery (1874-1942)-whose Anne of Green Gables and many other novels are loved by readers around the world-kept extensive journals for most of her life. The fourth volume of the immensely success Selected Journals of L.M. 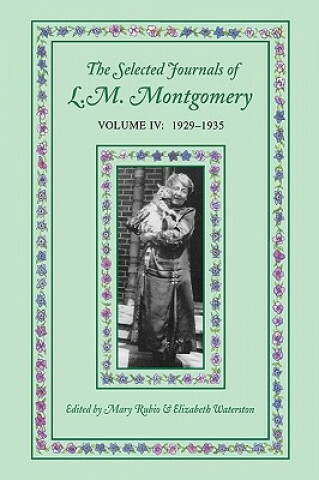 Montgomery covers the years from 1929 to 1935, a tumultuous period in the writer's life. The stock market crash, a drop in royalties from her many books, the need to provide her two sons with a university education, her husband's modest church salary often in arrears, and the fact that many loans she had made to friends and family were not repaid, placed Montgomery in the position where she had to type her own manuscripts for the first time since 1910. She also had to face personal crises as her sons' university results were extremely disappointing and her husband suffered a total nervous breakdown. Yet this was not a period without joy as well-the volume opens with travels to Prince Edward Island and western Canada and ends with her looking forward with great excitement to a new life in Toronto.